A close up view of the Green's lights. A close up view of the tree lights at George & Liz's. 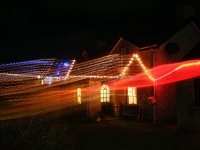 A closer view of Liam & Alison's house lights. 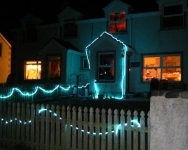 A closer view of Loughie & Margaret's lights. 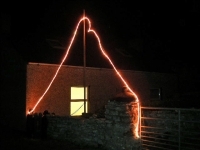 A closer view of Loughie's lights. 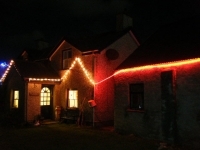 A closer view of Marina & Seamus' lights. A closer view of Peggy's lights. 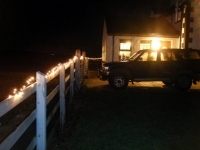 A closer view of the Cecil's garden lights. 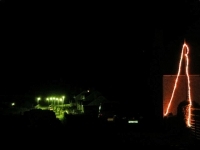 A closer view of the Cecil's lights. 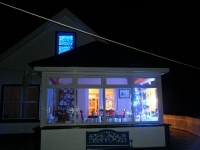 A closer view of the window lights at Loughie & Margaret's. 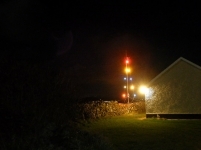 A view from the road of Marina & Seamus McMullan's lights. An accidentally artistic take on Peggy's lights.